VATICAN CITY (CNS) — Europe must recover the memories and lessons of past tragedies in order to confront the challenges Europeans face today that seek to divide rather than unite humanity, Pope Francis said. While the founding fathers of what is now the European Union worked toward a “united and open Europe,” free of the “walls and divisions” erected after World War II, the tragedy of poverty and violence affecting millions of innocent people lingers on, the pope told European leaders gathered at the Vatican March 24. 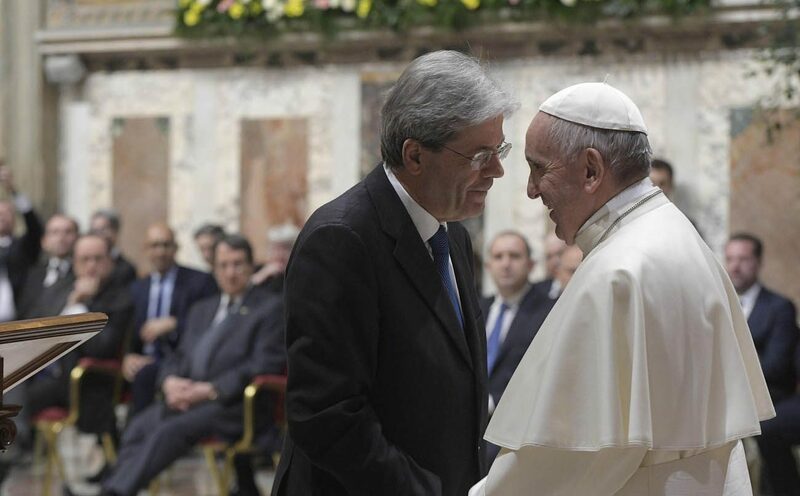 Pope Francis welcomed the 27 European heads of state to the Vatican to commemorate the 60th anniversary of the signing of the Treaties of Rome, which gave birth to European Economic Community and the European Atomic Energy Community. Signed March 25, 1957, the treaties sought to unite Europe following the devastation wrought by World War II. The agreements laid the groundwork for what eventually became the European Union. Entering the “Sala Regia” of the Apostolic Palace, Pope Francis placed his hand above his heart and bowed slightly to the European leaders before taking his seat. At the end of the audience, he and the government leaders went into the Sistine Chapel and posed for a photograph in front of Michelangelo’s fresco, The Last Judgment. The migration crisis also offers an opportunity for Europe’s leaders to refuse to give in to fear and “false forms of security,” while posing a much deeper question to the continent’s citizens. By defending families, investing in development and peace and defending the family and life “in all its sacredness,” Europe can once again find new ways to steer its course, Pope Francis told the European heads of state.